A former top Renault executive is suing over allegations he sold industrial secrets and is taking the French car maker to court for sacking him, his lawyer said Wednesday. Michel Balthazard is one of three executives sacked last week after the firm accused them of industrial espionage reportedly involving the company's key electric cars programme. Balthazard is taking the legal action "to sue the persons ... who have seriously damaged his honour in a context of media over-exposure," his lawyer Pierre-Olivier Sur said in a statement. The lawyer added that his client, who denies any wrongdoing, was taking Renault to an industrial tribunal to contest his sacking. The defamation suit targets "persons unknown". Another of the three sacked executives, Bertrand Rochette, has begun similar legal action. Renault itself has launched legal action for industrial espionage after it sacked the three managers. The company said on Thursday it had lodged a complaint for "industrial espionage, corruption, breach of trust, theft and handling stolen goods." State prosecutor Jean-Claude Marin said the charges alleged that "elements concerning France's economic secrets" had been leaked "to a foreign power." 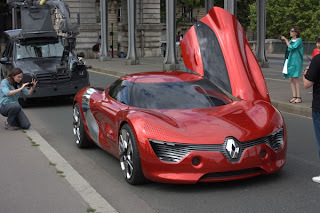 The French daily Le Figaro has reported that Chinese interests stood to benefit from spying on Renault's electric car programme, on which it is staking its future. China has angrily denied any involvement. The three executives deny involvement and were not named in the company's judicial complaint on Thursday. Under the French judicial system prosecutors can investigate allegations without a defendant being named. Renault and its Japanese partner Nissan have staked their future on electric vehicles and plan to launch several models by 2014 to meet rapidly rising demand for more environmentally friendly methods of transport.